Our Amish Bellagio Barstool will add a warm, Italian feel to your home decor. The Amish Bellagio Barstool has an attractive, simple back design which is very contemporary in style. 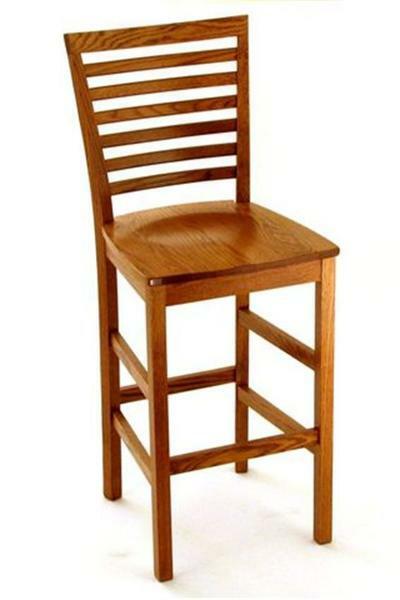 This solid wood Amish Barstool is sure to be comfortable and inviting for friends and family. The contemporary style of these Amish stools displays the smooth forms and clean outlines that make it visually appealing. The Bellagio, with its shapely stool back is sure to stand out in your kitchen or at your bar area. Take a look at our collection of Amish Home Bars to create an area that invites you to relax and have some fun. These contemporary counter chairs are completely customizable. Select the wood and stain you are looking for and consider wood, fabric or leather for the seat. We are happy to send wood and stain samples for your consideration.